John has now put up my magnetic noticeboard, which has been hanging around for years, and my rail and tubs from Ikea, a much more recent purchase! I have also got two printouts of some of the bags I have created, this is really useful, because I have been able to refer back to designs, see what I’ve really been happy with, what has worked, and what I have loved making! I also have now almost filled both of my sewing spool racks, just need more bobbins now! The one thing that I would really like to get now would be a larger cutting mat, I have quite a large one already 17″ x 24″ but one that would cover at least one half front to back of the desk would be great, and so useful. So lovely and tidy. 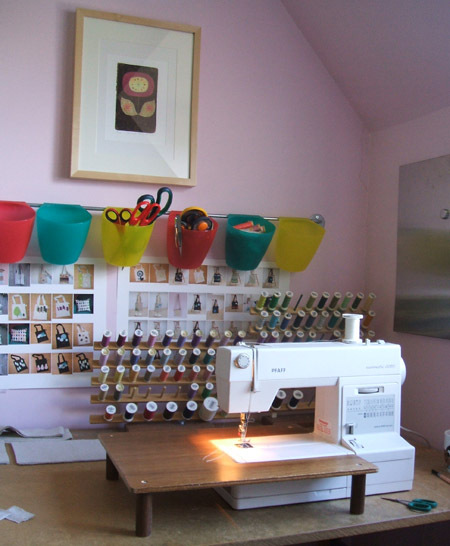 Wish mine looked like this (although I did get round to filling my spool rack this week, out of the way of fiddly little fingers). My shrub is starting to flower! hello. we are in the same treasury today. I love your work. Your bags are lovely. thought i’d ay hi! pretty workshop you have! It’s such a nice corner! I’m jealous!!! Where did you get your swing spool racks? Hi, I have a solution for your cutting mat problem, buy 2 or 3 large ones and cover the entire surface – if you have some green florists tape, you can put this over the joins to a) conceal them and b) prevent having a bumpy bit in the middle.